On my first day as a radiology manager, my boss at the time said, “The very first thing we do is sign you up for an AHRA membership; you cannot succeed and advance as a leader in this industry without one!” In those days the application process was pen and paper which was then faxed or mailed to AHRA headquarters. So, I filled out the paper form and off it went through the telephone lines. Boom! I was a member. When I attended my first Annual Meeting a few years later, I was immediately taken by the sense of community, camaraderie, and outreach. I wanted to be more involved, so I volunteered to introduce speakers and proctor educational sessions. Soon, I began to research more enduring volunteer opportunities, and since I liked to write, I became a member of Radiology Management’s Editorial Review Board and eventually was appointed Editor in Chief – tasked with filling the shoes of the legendary Gary Boyd. A very tough act to follow! From my beginnings on the Editorial Review Board, my volunteer services continued non-stop for the next 18 years, moving from Editor in Chief, to the Board of Directors, Finance Director, and eventually AHRA President. I continued my volunteer work as Chair of the Education Foundation and went on to serve many more years on a variety of committees – including the Leadership Institute’s Basic Track faculty. I’ve spent my entire career in a hospital based setting, changing jobs from time to time, moving to different parts of the country, and seeking better opportunities and bigger challenges. But through it all, my active involvement with AHRA has been a constant and the driving force, a beacon if you will, in my growth and development. 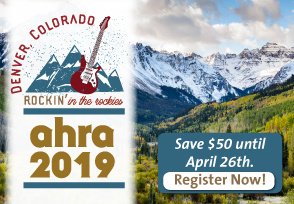 The power of networking and continuous learning through the AHRA community is immeasurable, and over the years I’ve developed lasting, deep-seated friendships and partnerships with so many talented and gifted leaders all across the country. When I saw that AHRA was looking for a Deputy Executive Director, I immediately updated my resume and applied for the position. To me, this decision was a “no brainer.” As crazy as it sounds, when I was finally offered the job as Deputy Executive Director at AHRA it was kind of like “coming home.” AHRA truly is a family with a strong sense of belonging for so many. So, after being an association member for more than twenty years, I’ve made a major life and career change. As of January 2, 2018 (my first day on the job), I’m now a “non-member” and non-radiology healthcare administrator, and privileged to work with the very talented and dedicated staff here at AHRA headquarters. In my new role as Deputy Executive Director, I will work directly with the Board of Directors, CEO, and AHRA staff to ensure implementation of our strategic goals, consistent with AHRA’s core purpose, mission, and values. I’ll dedicate time working closely with our Regulatory Affairs Committee to support their efforts expanding industry awareness of the impact of regulations that affect our medical imaging management community. My responsibilities will encompass management of all aspects of the association including membership development, engagement, and retention; outside government advocacy activities; as well as day-to-day operations and oversight of our team. This is an exciting chapter for me, and I look forward to continuing my service to the AHRA community in this new role, advancing our strategic initiatives and enhancing our relevancy as the organization of choice for imaging management professionals navigating the multitude of challenges facing our healthcare landscape. Please feel free to reach out to me at any time at AHRA headquarters – I look forward to hearing from you. Jay Mazurowski, CRA, FAHRA is the deputy executive director at AHRA. He can be reached at jmazurowski@ahra.org. Welcome to your new role, Jay! We’re fortunate to have you in this capacity and hope you enjoy! Congratulations, Jay! I am sure that you will be an asset to this amazing organization! This article truly embodies the many great qualities of AHRA. Fantastic article, Jay! Seeing you in many of the volunteer roles and at so many of the conferences and meetings it only seems natural that you are now in a full-time role with the organization. I know that the organization is in good hands and will continue to grow and serve the profession well. Congratulations again on the career change. Congrats Jay, you will do an outstanding job.